Where to start? Get in touch to book in for two Free Introductory Lessons to give you a chance to experience the school, and see how much your kid enjoys it. KMAX Students train two nights per week, with each class covering a different training topic. It is ideal for Students wanting to improve and move through the grades faster, with up to 3 gradings per annum. It is also ideal for those who struggle to remember the technique or just aren't performing the practice needed at home. By the time a Student reaches Brown Belt they are required to be on Dragon Membership in order to start the hard work towards Black Belt. 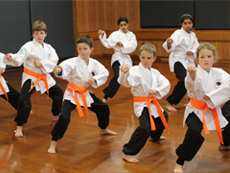 KMA Students train one night per week and have two classes per week to choose from. With hard work and regular practice they can be graded up to two belts per annum. This is ideal for kids with many other activities on during the week and for those keen to 'give it a go'. 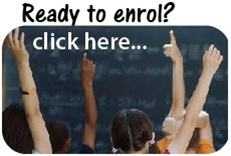 All classes are run during the standard school terms only, and class sizes are limited. Please call or email us to check availability. What's the KMA Family Class? This class gives parents the chance to join in and train with their kid. The syllabus covered is the KMA Martial Arts syllabus. Once a kid is enroled one parent can train with him or her for just $40 for the entire school term for one night per week, or $80 for two. An initial joining fee of $75 for each person applies and both receive a uniform and manuals. This an affordable and fun way to get fit and learn some essential self defence skills with your kids. 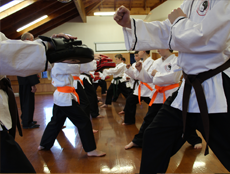 What is different with the KEMPO ACADEMY? The Academy takes the training up to another level. It incorporates traditional training and moves at a faster tempo. 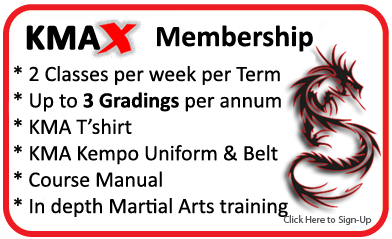 This is ideal for adults and older kids who want to take their martial arts training further. Learn full Shaolin Kempo Forms and sets, train with traditional weaponry, take part in light conditioning and breaking (optional) classes, and study further the history of martial arts and other systems. Learn more advanced Self Defence including multiple attacker and weaponry defence. 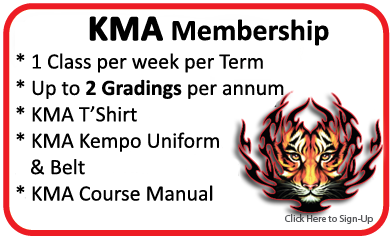 Increase your confidence and understanding of the art and take part in the Assistant Instructor courses and help teach the KMA Martial Arts classes. This is a non-contact class. PLEASE NOTE: An initial $75 Joining Fee applies. Family's receive a 20% Discount for any additional family members training (only the first is at regular rate, excludes family class & Black Belt class). 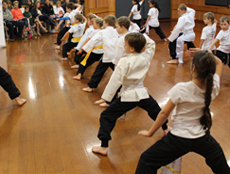 *FAMILY CLASS Rate includes tuition and gradings for one parent when an existing kid is enroled. **KEMPO ACADEMY students will need to buy their own traditional weaponry over time as they train towards their KMA Black Belt. The committment period is per school term. If you start part-way into a term the Term Fee is reduced accordingly. The initial Joining Fee is due before commencing. The Term Fee may be paid either up-front or on terms as agreed via A/P. Membership can be cancelled at the end of any school term. Payment is via cash, cheque, or internet banking.